Potato Pancakes – light, melt-in-your-mouth potato pancakes with crisp edges. Made with freshly grated potatoes seasoned with onions, garlic powder, salt and pepper and nutmeg. Can be served as a side dish, appetizer or a light main dish on its own. Our family is in a breakfast potato kick lately after we had this Hashbrown Breakfast Casserole. And so I decided to make them these delicious Potato Pancakes made from freshly grated potatoes. To my surprise, it flew off the table so quickly that I had to make another batch. Looks like my Fluffy Pancakes has found a true rival in these Potato Pancakes. Potato Pancakes and Latkes are mostly used interchangeably. Both of them are actually potato fritters shallow-fried in oil and are usually binded with egg. But with further digging online, there are actually several differences that sets them apart from each other. First. 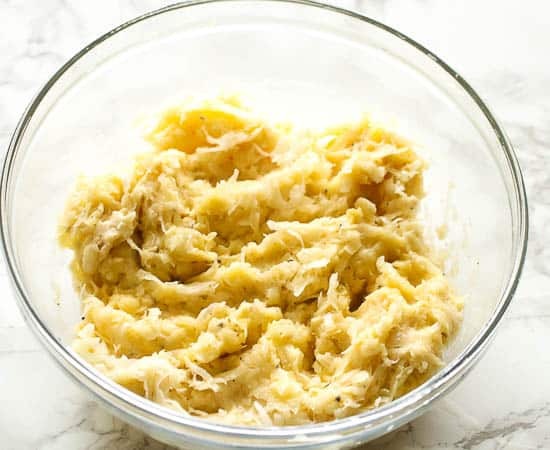 Potato Latkes are shredded on the largest hole of the grater which means that they are faster to prepare compared to Potato Pancakes. 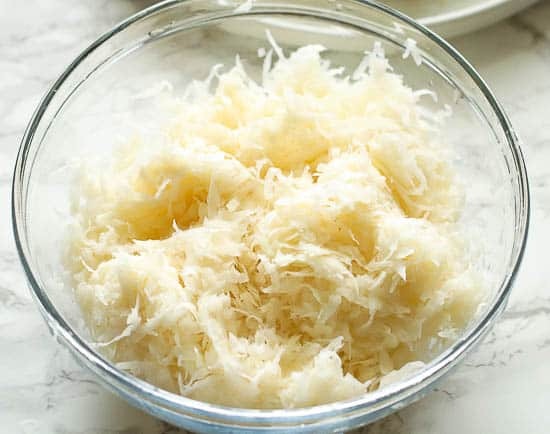 On the other hand, Potato Pancakes are either shredded using the smallest or the medium side of the grater. This results to a finer consistency for softer and melt-in-your mouth pancake texture. Second. 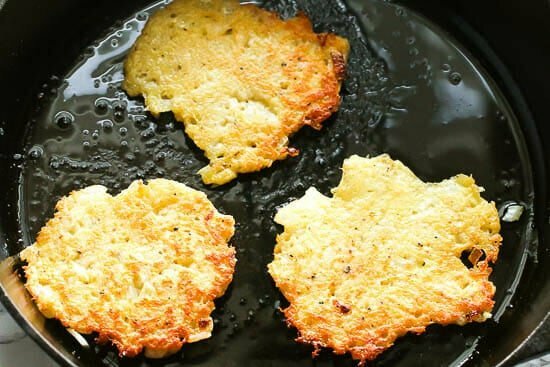 Potato Pancakes are softer just like the regular pancakes while Latkes are crunchier because of its larger shreds which leads us to the next point. Third. Since Latkes are made with large shreds, you’ll notice that there are pieces of shredded potatoes sticking out here and there. Unlike Latkes, Potato Pancakes look rounder with cleaner and smoother. They are also lighter and thinner compared to regular pancakes and much more compared to thicker Latkes. Lastly. 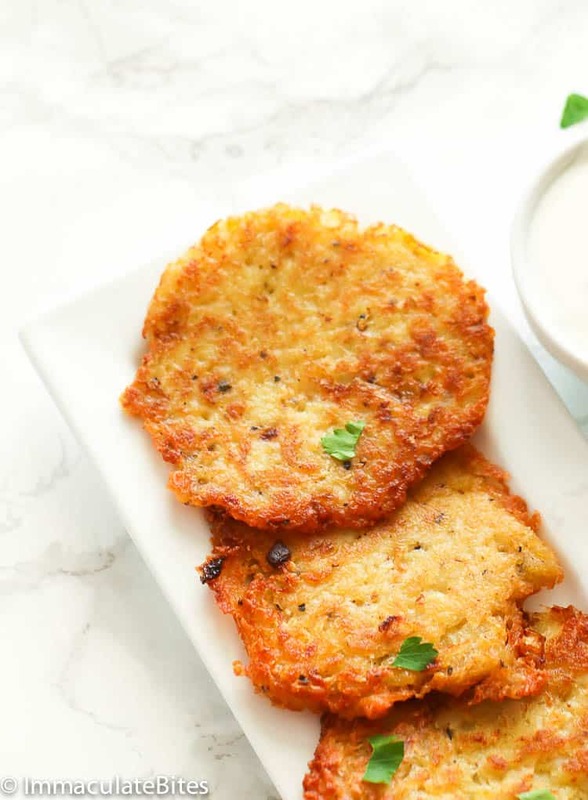 Potato Pancakes are cooked around 3-4 minutes each side, while latkes take around 4-5 minutes per side because of its thicker texture. Both of these two have a great potato taste but can also be seasoned on the savory or sweet side. 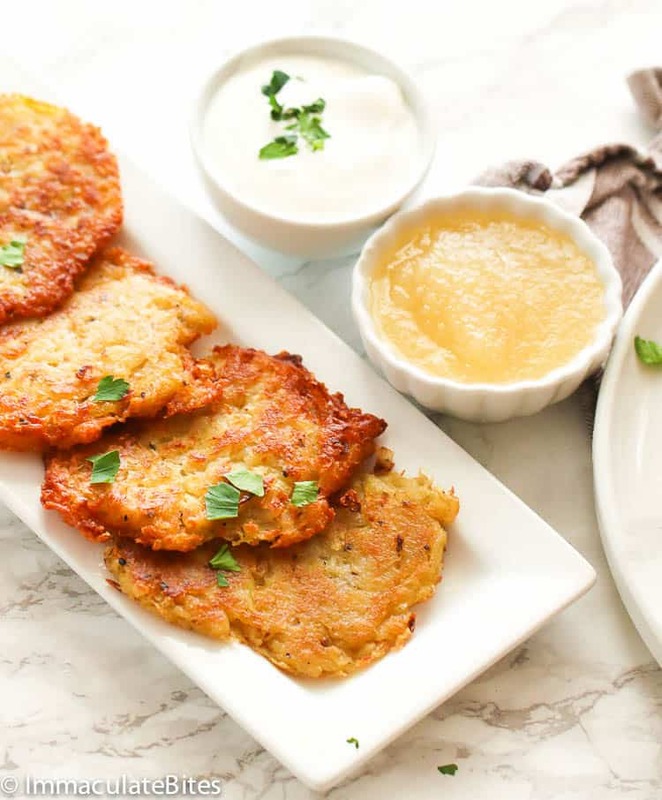 What Kind of Potatoes Are Best For Potato Pancakes? Pancakes’ fluffiness is perhaps its BEST selling point. If you’d ask my son, fluffy pancakes are a real breakfast gem to him. Now what makes these Potato Pancakes a new breakfast favorite is they are as fluffy as the original pancakes. To achieve that nice consistency, starchy potatoes like Idaho or Russet are the perfect choice as they are high in starch content. They are also great for baking and boiling (hello Mashed Potatoes). If you don’t have Russet potatoes in your pantry, you can use Yukon Gold or Kathdin potatoes instead. 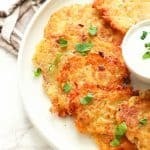 How to Make Potato Pancakes From Mashed Potatoes? 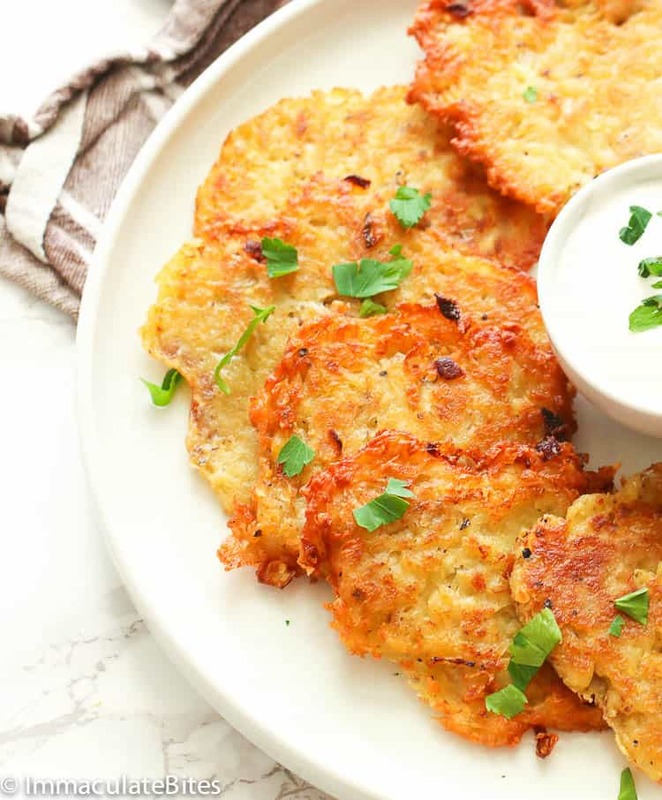 These Potato Pancakes are the best recipe to use whenever you have leftover mashed potatoes especially during the holidays. You can simply transfer it in a larger bowl and add all the ingredients as mentioned in Step # 3. Make sure to mix everything carefully. And you can have an incredible breakfast or appetizer in no time! Can I Make Potato Pancakes Ahead of Time? Honestly, Potato Pancakes are best enjoyed when fresh right out of the frying pan. But I know, there are times that something gets in the way. So to make it ahead, you can fully cook them as directed in the recipe below. Let them cool down completely. Then, transfer them in single layer on a baking sheet and flash freeze for two hours or until hard enough. Lastly, transfer the frozen potato pancakes in a ziploc or freezer bags and freeze for up to two weeks. When ready to serve, place them on baking sheets in a single layer and bake in a preheated oven at 450F and bake around 15 minutes. I just can’t exactly tell you how we enjoyed these pancakes here with apple sauce and then with sour cream on the next day. They are both awesome. My kid went crazy for these! Mango Chutney is also a great upgrade for apple sauce. For those who want it to be more of a hearty meal, you can serve or top it with bacon bits, sauteed veggies, sausage and eggs. Or even as simple as ketchup. It works with whatever you have! 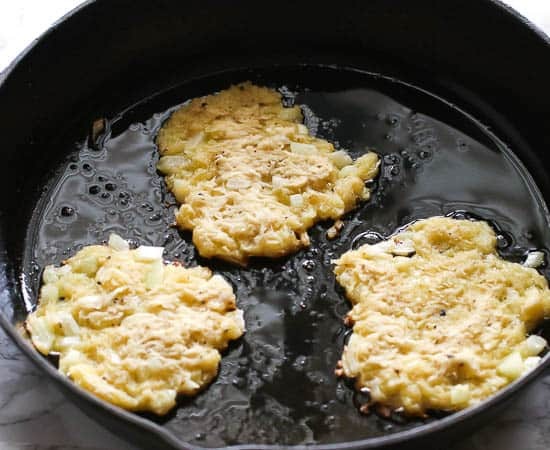 To avoid a mushy potato pancakes, you need to squeeze as much liquid as possible from the grated potatoes using a fine strainer or cheesecloth. 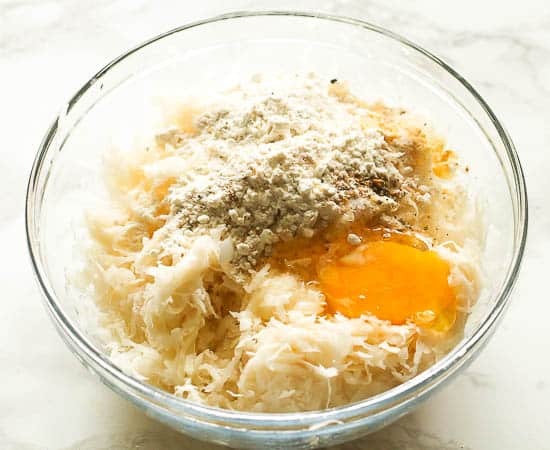 If you want to avoid the greasing elbow of grating, you can use a food processor instead. Peel them first and cube before transferring into the food processor. Process for about 2 minutes or until no lumps are visible. Then strain the processed potatoes as per step # 2 and proceed as directed. If you’re batter is a bit runny for you, add a tablespoon more of flour and mix well. 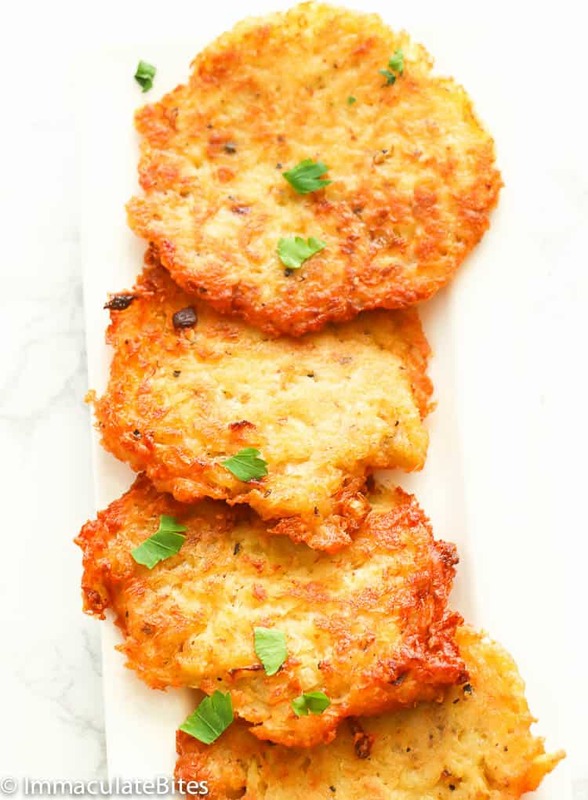 Potato Pancakes - light, melt-in-your-mouth potato pancakes with crisp edges. Made with freshly grated potatoes seasoned with onions, garlic powder, salt and pepper and nutmeg. Can be served as a side dish, appetizer or a light main dish on its own. Peel and grate potatoes using the medium side of a box grater. Place the potato into a fine strainer or cheesecloth and try to squeeze as much liquid as you can into a bowl. Return the potato into a medium bowl and add onions, flour, garlic, salt, black pepper, nutmeg and eggs. Mix everything well until fully combined. Heat oil (about 2 tablespoons) in a large, non-stick skillet or cast iron over medium- high heat. Drop about 1/4 cup potato mixture into hot oil, and press lightly to flatten with the back of a spoon to make 1/2 inch thick pancakes. Fry, turning once, until golden brown for about 3 to 4 minutes on each side. Cook about 3 to 4 patties at a time. Transfer pancakes to paper towel to absorb the excess oil. Repeat until all potato batter is used. Serve with applesauce and or sour cream. Peel and grate potatoes using the medium side of a box grater. Place the potato into a fine strainer or cheesecloth and try to squeeze as much liquid as you can into a bowl. Return the potato into a medium bowl and add onions, flour, garlic, salt, black pepper, nutmeg and eggs. Mix everything well until fully combined. Heat oil (about 2 tablespoons) in a large, non-stick skillet or cast iron over medium- high heat. Drop about 1/4 cup potato mixture into hot oil, and press lightly to flatten with the back of a spoon to make 1/2 inch thick pancakes. Fry, turning once, until golden brown for about 3 to 4 minutes on each side. Cook about 3 to 4 patties at a time. Transfer pancakes to paper towel to absorb the excess oil. Repeat until all potato batter is used. Serve with applesauce and or sour cream. Which potato was used for this recipe? Irish or sweet potato? 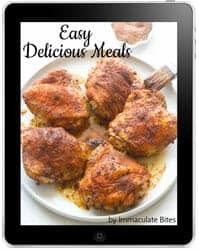 I use Russet potatoes for this recipe as they are starchy. Please see blog post above. Thank you. Rice flour too might be an alternative. I find it helps with binding the mixture like flour and also adds crispness when frying. That’s a great tip! Thanks for sharing Reena. Thank you for sharing your thoughts, Myron. I appreciate it. Can you use potato flour to make these gluten-free? I have a friend who’s an actual celiac and she desperately misses potato pancakes from her childood. These would be a great surprise. Yes you can. Keep in mind that you might have to make some adjustments; potato flour absorbs more liquid than all-purpose flour.